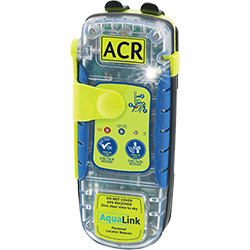 ACR Electronics, Inc. is the leading development center for emergency beacons that are designed with one purpose in mind: Saving Lives. Through our combined technology expertise in the marine, aviation, outdoor and military markets, ACR designs and manufacture cutting edge rescue beacons and survival gear for boaters, pilots, hunters, hikers and combat troops, not to mention many of the leading boat builders and aircraft manufacturers in the industry. The GlobalFIX™ V4 is a full-featured EPIRB loaded with high-efficiency electronics for performance..
Globalfix iPRO406 MHz GPS EPIRBw/ Dual GPS Technology - Innovative Digital DisplayCategory 1Th..
Globalfix iPRO406 MHz GPS EPIRBw/ Dual GPS Technology - Innovative Digital DisplayCategory 2Th..
GlobalFix Pro 406 MHz Category I GPS Emergency Position Indicating Radio BeaconHead offshore with co..
GlobalFix Pro 406 MHz Category II GPS Emergency Position Indicating Radio BeaconHead offshore with c..
At 4.6 oz, the ResQLink distress beacon weighs less than a couple of energy bars. And topping just..
Head offshore with confidence. With three levels of integrated signal technology - GPS positioning,..
AquaLink 406 GPS PLBHead offshore with confidence. With three levels of integrated signal technology.. The new Firefly PRO emergency strobe light boasts an all-new light output power management system .. The Firefly PRO Waterbug is a SOLAS-approved strobe light with a built-in water activation feature..
Dual lamp design provides redundancy, reliability-works when you need it Bright, powerful halogen.. When seconds matter, mariners count on the grab-and-go reliability of ACR's RapidDitch™ Bag. This .. This compact and buoyant safety tool conveniently keeps all your essential safety gear organized a.. Product No. 1930.3 (12V)/ 1931.3 (24V)Remote Controlled Searchlight200,000 candela Internal, elevat..